On a secluded site, surrounded by tropical Queensland rainforest, a tranquil garden is emerging. A project of Chenrezig Institute, the towering central development of eight large stupas depicts the great deeds of the Buddha’s life. Many smaller stupas, containing the ashes of those who passed away, have been placed throughout the landscaped slopes along the water features, or under trees planted by visiting teachers. Garrey Foulkes, who has coordinated the Garden over the past twelve years, tells the story. The Garden is based on an idea Lama Zopa Rinpoche initiated during Chenrezig’s twentieth anniversary celebrations. Initially, we were going to build quite a large stupa (around five stories high) for Geshe Thingley, who was one of our first resident teachers. As I remember, Rinpoche suggested that it would be very beneficial if we created a beautiful garden around that stupa, and in the garden we could place smaller stupas containing the ashes of deceased people. The project developed from there. 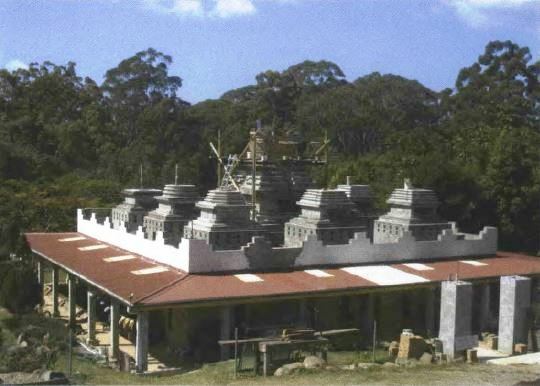 Early on the decision was made to place the stupa on the roof of a building to add elevation, and to create a useable indoor display area for more stupas, a mandala house, and other traditional artwork. Eventually there will be 108 prayer wheels on the outside walls of the building under a veranda, enabling circumambulation during the wet season. 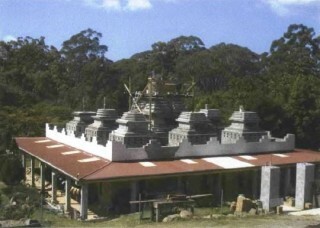 We are a year or so away from having the eight main stupas finished. The project has been going for about twelve years now, but due to a lack of initial finances we started rather slowly. Over the past eight years we have finished the most difficult physical work and many expensive stages of the construction. Now that this is behind us, there will be an increased focus on preparing all of the ingredients and the decorations for completing the stupas.